My initial interest in learning disabilities stems from childhood experiences with my younger brother and friends who had learning disabilities. As a result of this early interest, I pursued a career in special education and found myself working at a school for students with learning disabilities (Eaton Arrowsmith School). It was here that my interest in motivation grew, as I wondered why and how some students were so much more motivated than others, and wondered about the short- and long-term ramifications of different types and levels of motivation. I have chosen to look at resources on the topic of Intrinsic Motivation and Learning Disabilities because of the strong association between academic success (in terms of both achievement outcomes and long-term educational success) and intrinsic motivation. For example, studies have shown that when students are intrinsically motivated to learn, both retention of information and generalization of knowledge are improved (Dev, 1996). I wanted to examine this link between intrinsic motivation and academic outcomes specifically in students with learning disabilities, as I was curious about whether a stronger, weaker, or simply different relationship would be found. Intrinsically motivated behaviours are defined by Deci (1975) as behaviours that individuals engage in to feel competent and self-determining (two primary needs that Deci believes all human beings are born with). These behaviours function to seek optimal stimulation (challenge), and to conquer challenges and reduce incongruity or dissonance (Deci, 1975, p. 61). 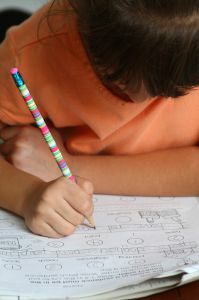 According to the Diagnostic and Statistical Manual of Mental Disorders (DSM-IV-TR) (2000), learning disabilities are generally diagnosed when an individual’s academic achievement on specific standardized tests is significantly below what would be expected, given their intelligence (which must be at an average or above average level), age, and schooling. It is widely estimated that 1 in 10 students in Canada, and in the US, have learning disabilities. The following information on the topic of intrinsic motivation and learning disabilities is intended to serve as a brief overview of important contributors and contributions to the field, but should not be seen as a complete list of the resources related to this topic or of the individuals studying this issue.